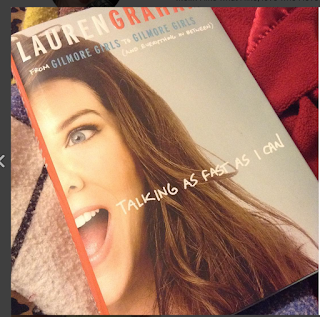 "Talking as Fast as I can" is now on my absolute favorites list of books because Lauren truly is a Lorelai in real life, minus the whole single mother aspect. As you read this book you will notice how much of Lauren as a person is put into Lorelai as a character. Lauren is funny, and bluntly honest about the role acting has played in her life. She makes a point of talking about being a female and how sexism in hollywood. She has a chapter where she points out that we as females can be happy about being single and love it because only when we love it will we find ourselves seeing more happy relationships in our lives. She also has a beautiful tribute to the Late Ms Carrie Fisher and her life as an amazing writer. She talks about the ending cliffhanger to Gilmore Girls revival without mentioning the last four words and how much those words are cliffhangers. She just really observes and gives her best opinions of life while being so funny. I hope you liked this review and I planned on writing more books reviews. As always I will have the link to this book and the author's social media along with my links. Please feel free to follow and subscribe to my links along with this Blog. Hope you have an awesome Gilmore Girl day.